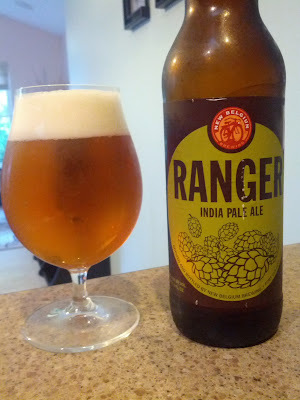 If you recall from my New Belgium review roundup I failed to write, or more likely failed to save, my notes regarding my tasting of their Ranger IPA. You may also recall that I freaking loved their beers. So when I made a pit stop in Nashville last week I was sure to pick up some more Ranger. You can get New Belgium in Indiana as well, but still no distribution in Ohio or KY. Pours a great amber brown with a splash of golden hues mixed around. Poured out a thick fluffy white head with loads of tiny bubbles. The head dropped fast but left lacing around the glass. Smells is packed with pine. Taste is up front and grasping with bitterness. Lightly aggressive, not much, but it’ll wake up your senses a bit. Don’t think this is a 1 taste show packed with hops though, there is also a light mingling of caramel malts. Over all this is a slightly sessionable beer, might be a bit much for a long session but I imagine you could easily drink 4 or 5 pints w/o a problem. Great overall IPA flavors that will be very familiar to anyone who has had an American-style IPA.